Get the wee ones their own nativity and they'll leave yours alone! I'm a sucker for a beautiful nativity, but you can't really put a fancy one under the tree with a curious toddler running around. That's why my husband and I were so excited to stumble across Fisher-Price's Little People Christmas Story Nativity Playset when we were at Walmart on Long Island. The set was so stinking cute and really well-priced ($36 for an originally $79 deluxe set) that we had to get it. So, what did I get in our nativity? As I mentioned, we were lucky and got the deluxe set at Walmart. 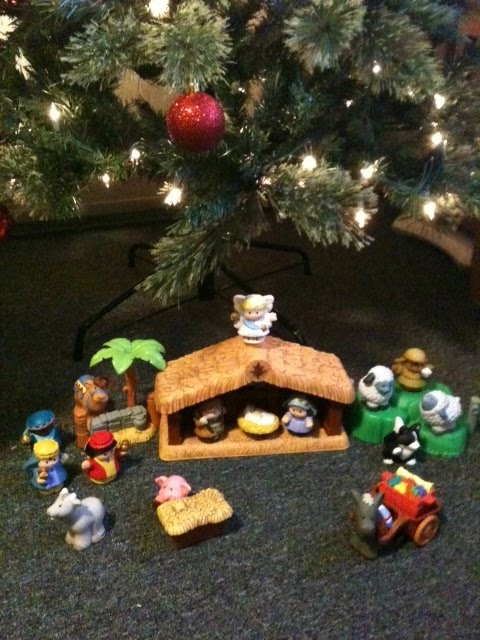 It came with the musical manger (the star lights up and plays "Away in a Manger"), a grassy knoll for the sheep, and a palm tree scene for the Wise Men. Character-wise we have: Mary, Joseph, baby Jesus, an angel, a shepherd, two sheep, a sheep-herding dog, three Wise Men, a camel, a pig, a donkey with a detachable cart, a basket of food to go in the cart, and a hay bale with a top that opens. That's a lot of Little People! And, if I can keep all the pieces together and remember to put it away at the end of the season, we'll be able to use it for many Christmases to come. I haven't been able to find such a good deal as in-store at Walmart for this set online, but there is another version of the Little People nativity available for around $40 on Amazon. If I am correct, the green deluxe set involves all the above, but the $40 white box set does not include the shepherd, the knoll or palm tree, and other additional pieces. You CAN find the deluxe set (green box) at Amazon for $70 HERE, but I recommend getting to your nearest Walmart and seeing if you can snag a deal. As far as toys go, this is on the expensive side, but if you view it as an addition to your Christmas traditions that you'll bring out every year, it may be worth it to you too! Aw, that's a sweet idea!